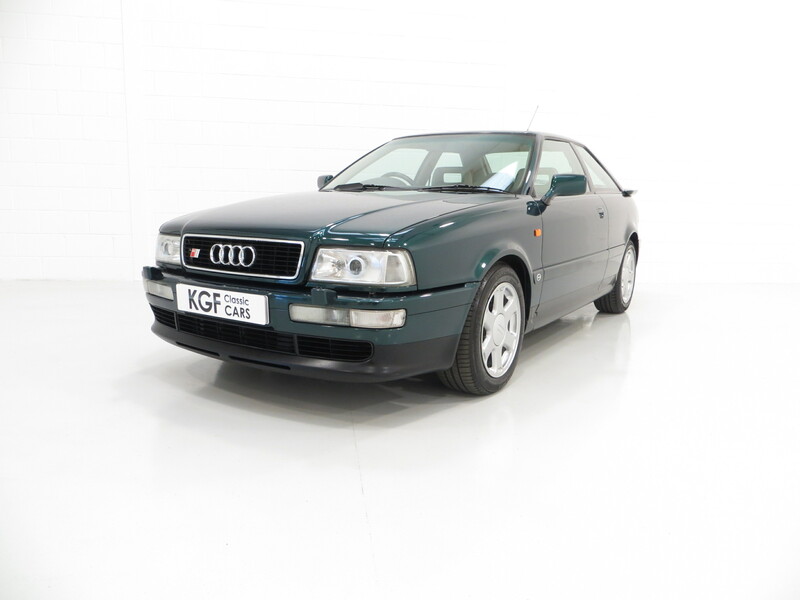 A fastidiously maintained Audi Coupe S2 in superb unmolested condition. Fully zinc galvanised bodywork, deformation zones, Procon-Ten frontal impact protection, Permanent four-wheel drive system, lowered sports suspension, colour keyed rear spoiler/front and rear aprons, halogen headlamps headlamp washers, anti-theft device with advanced immobiliser, heat insulating tinted glass, heated twin jet windscreen washers, on-board multi-function computer, sports front seats, oil pressure gauge, oil temperature gauge, battery voltage gauge, rear differential lock switch, toolkit, warning triangle. 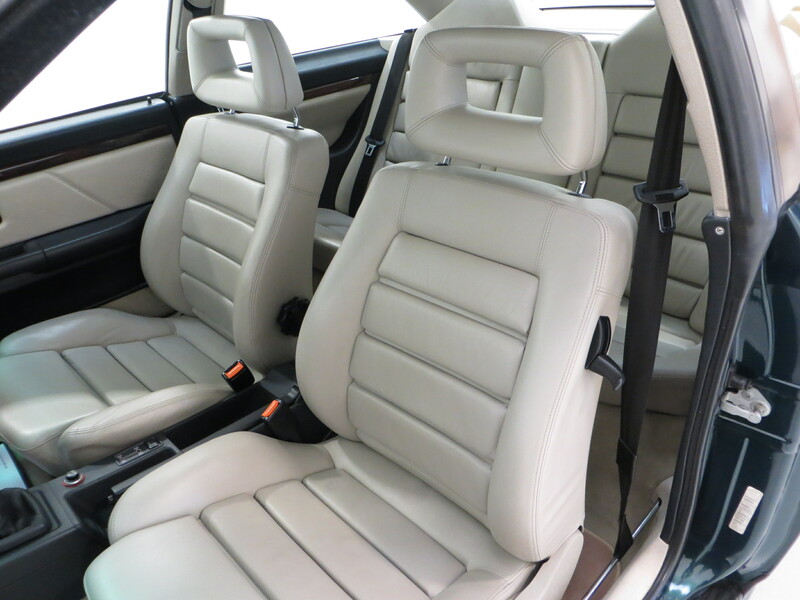 Factory options: Leather upholstery, air-conditioning. Dealer options; Audi floor mats. 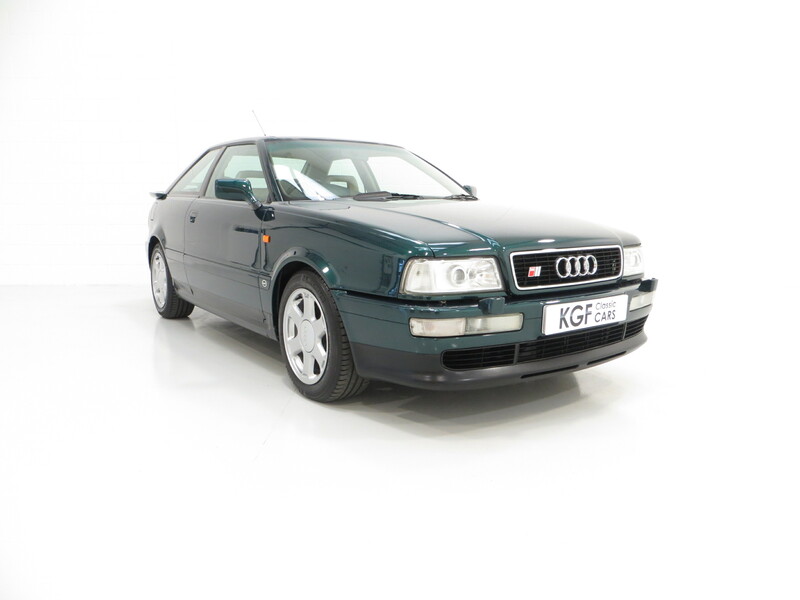 A spiritual successor to the legendary Audi Quattro, this Audi Coupe S2 heeds to the makers formidable Rallying heritage with its revolutionary permanent four-wheel drive system, turbo powerplant and short wheelbase. 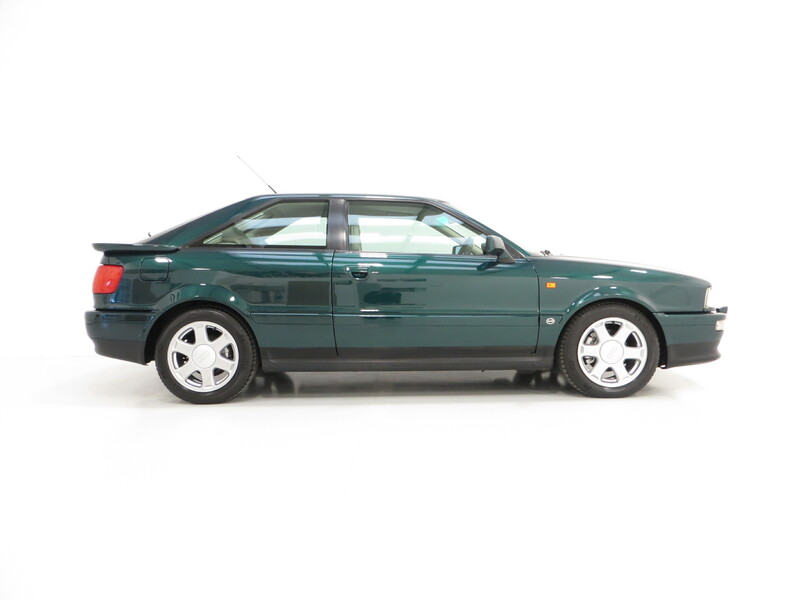 This fantastic and fastidiously maintained example in Audi Emerald Pearl Effect, (Code LZ6U), boasts a deep uniform shine and beautiful finish, a testament to high quality Audi paint and fastidious enthusiast ownership from new. All original panels are straight with uniform gaps, and only light markings can be seen including some very inconspicuous touched in stone chips and the plastic insert to one headlamp wash is missing. All quality trim pieces, security etched glass and badges are superb and Audi Main Dealer number plates remain fitted. 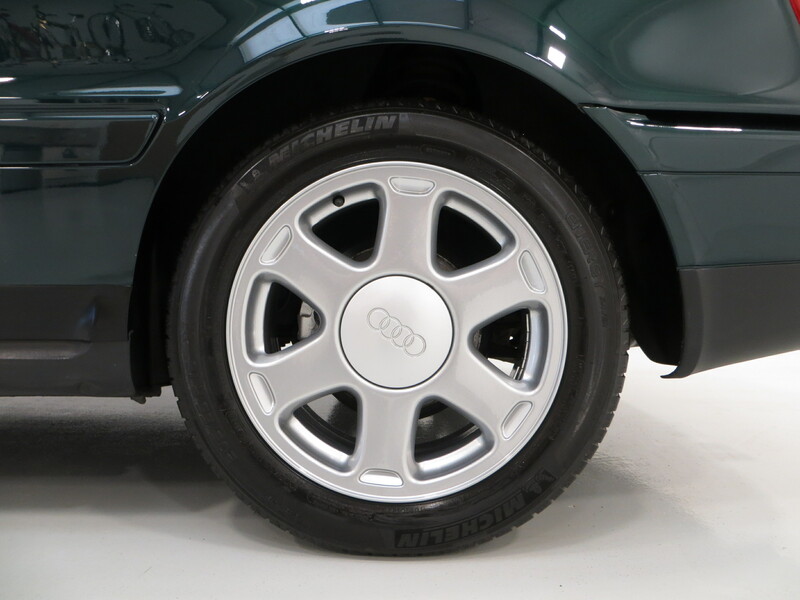 Appreciators of build quality will marvel at the legendary Audi craftsmanship, with this unmolested example certain to impress. This high specification S2 model is trimmed in factory optional Ecru Leather upholstery, (Code TJ), with matching colour scheme door cards, carpet and interior trim. The original seat coverings are clean and in very good order with no sagging, rips or damage and only light wear to the driver’s seat outer bolster. The supreme build quality can be felt in all buttons, controls and functions, all of which operate perfectly. The onboard computer, warning system and outside temperature gauge are all in perfect order with no failed LCD display pixels whatsoever, and the unique S2 grey dials give healthy read outs. The fascia and doors cards are as new and the quality carpets are pristine having been protected from new by genuine Audi rubber floor mats. 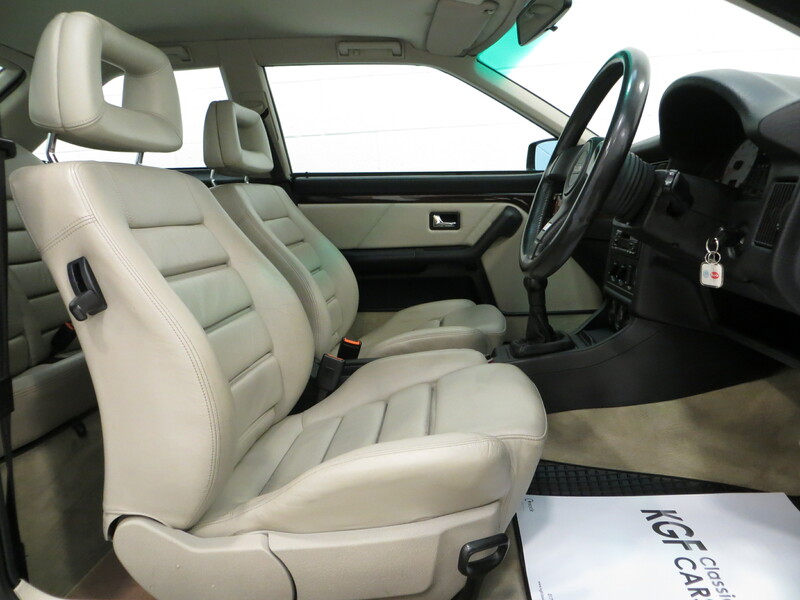 Built for the demanding performance enthusiast driver, this interior fulfils every requirement brilliantly. 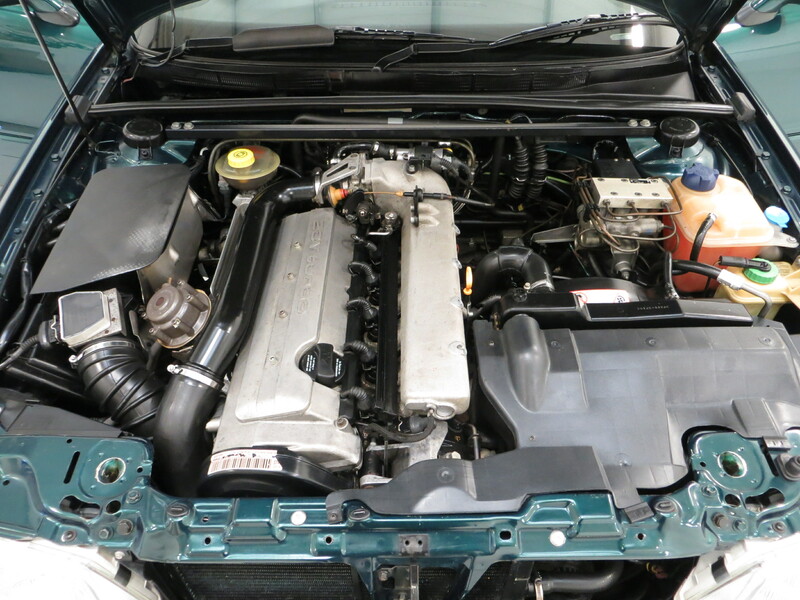 Fitted with the original and desirable ABY engine as verified by the engine number, the five-cylinder Turbo charged powerplant with intercooler features 20 valves and ‘overboost’ facility to increase maximum torque to 380Nm when necessary. Power output is quoted at 230bhp with performance figures quoted at a formidable 154mph top speed and 0-62mph in just 5.9 seconds! The engine bay is beautifully clean with factory plates and stickers proudly displaying the unmolested originality of this example. The six-speed short throw gearbox is light, precise and perfectly geared to compliment the power and excellent Quattro drive system. The special Five-Star 7J x 16 alloy wheels are in excellent order and are shod in matching quality branded Michelin Energy 205/55 R16 tyres with masses of tread remaining. 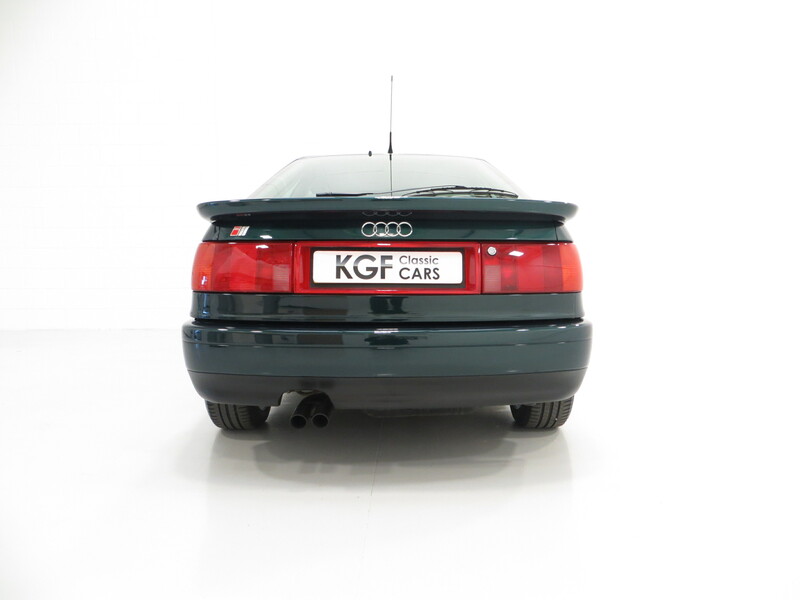 Housed alongside the spare wheel in the immaculate luggage area with pristine parcel shelf is the original Jack and tool kit, and the rear panel displays the factory options sticker. The Advanced Anti-Lock System (ABS) features discs to all four wheels to offer powerful, assured and safe braking power. 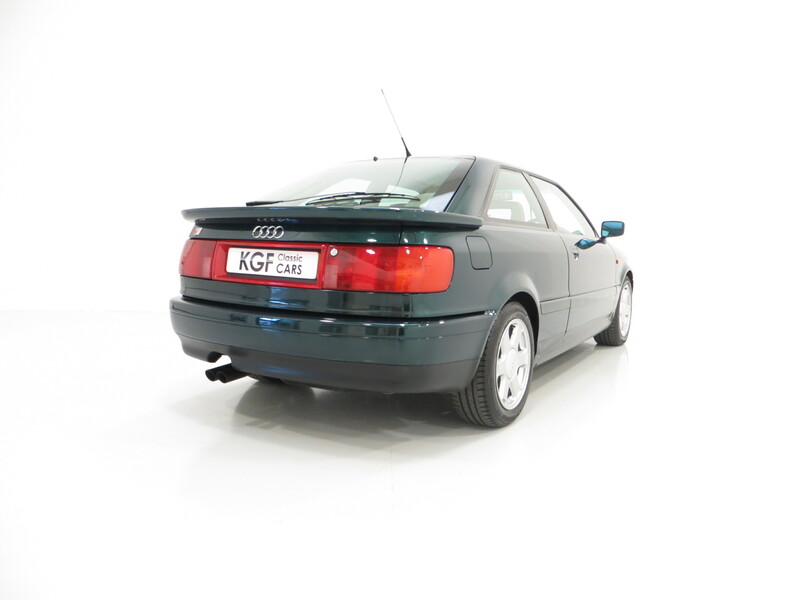 Supplied new on 17th January 1994 by Chevin Audi of Derby, this exceptional example has covered a fully documented 97,985 miles from new. The comprehensive service history includes the original service schedule displaying 19 stamped entries, the most recent in March 2018 for a full service, inspection, cambelt and water pump renewal. This is documented and was carried out by renowned Audi Group experts, V.A.S.S. Specialists and the car has covered just 500 miles since. 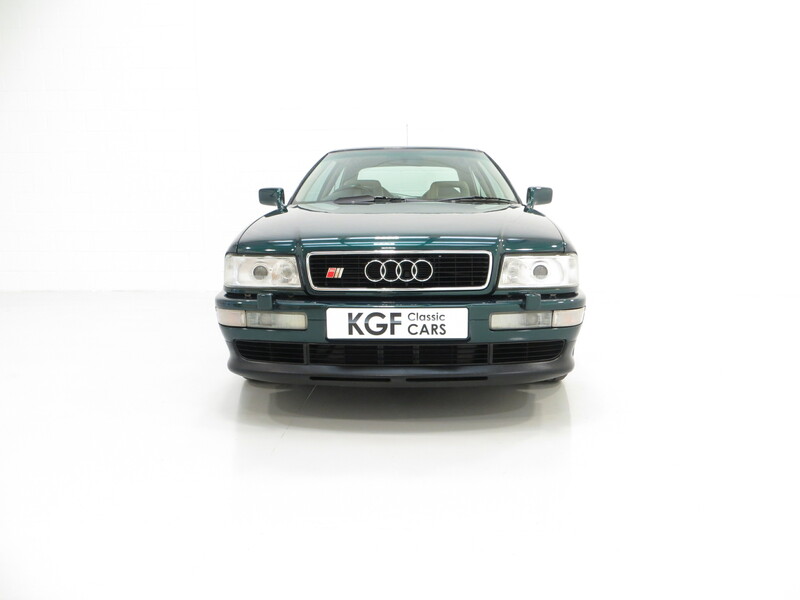 16 of the stamped entries are from the same Audi Main Dealer and one subsequent specialist. All handbooks, guides and dealership literature have been kept in the immaculate black leather wallet. 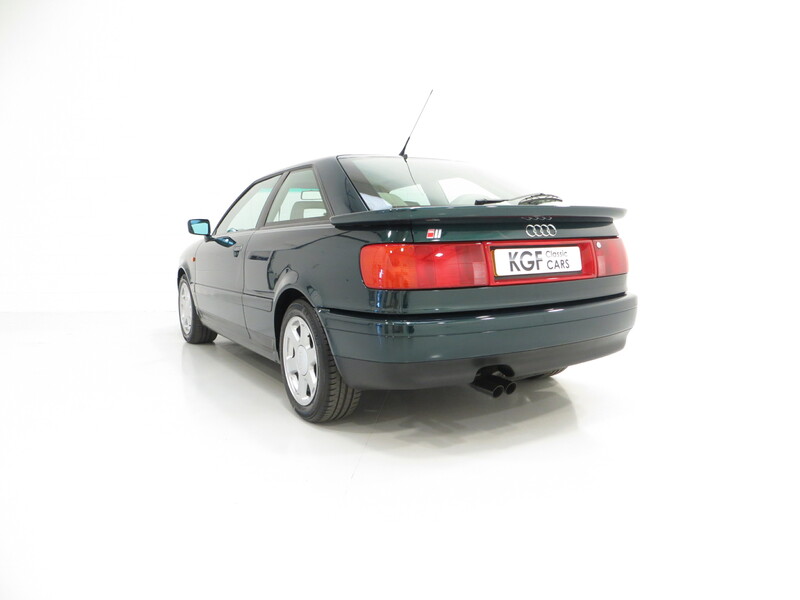 Completing the history file is virtually every MOT certificate since 1998, invoices for service work and cambelt changes as well as two original Audi keys and a 1993 Audi Coupe S2 sales brochure and specification booklet. This example has without question been maintained to an optimum level and cars with such fastidious upkeep are very rarely found. MOT December 2019, HPI Clear.